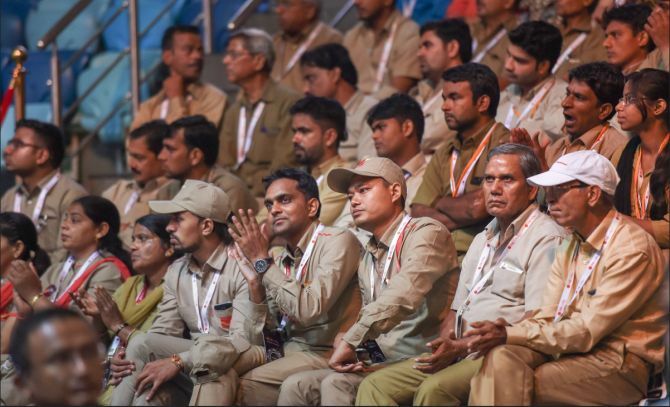 Each postman has undergone a three-tier training process, after which they were evaluated by the National Institute of Banking and Finance and given certificates. Rajesh Singh, a 30-something who has been a postman for five years, is proud of getting 150 people to open bank accounts in his area. He is one of the many khaki-clad postmen in the General Post Office of the national capital who have recently turned banking official for India Post Payments Bank (IPPB). A postman like him will help Prime Minister Narendra Modi open an account with IPPB, with Saturday’s launch of the most ambitious banking operation in the country in recent times. The bank, in which the Union government owns 100 per cent equity, got its licence in 2016, when the Reserve Bank of India issued 11 licences for payments banks. Three out of the 11 have returned their licences because of viability concerns. IPPB has a network of 155,000 post offices and 30,000 postmen, who have undergone training to perform banking services. Singh claims he was among the first postmen who signed up for the 30-hour training provided by the National Institute of Banking and Finance. He carries a mid-range Android phone with a separate biometric reader to capture fingerprints. He is quick to fire up the micro-ATM app on his phone. “A new version of the app was released this morning. So, I am getting used to it. There’s some issue with the on-boarding process, but most people get their accounts in less than 5 minutes,” he said. One can open IPPB accounts only through the Aadhaar e-Know Your Customer process. A client is required to provide their thumbprints and some information. The account is ready almost instantly. The accountholder is given a plastic card with a QR code with account details. They do not need to remember their account numbers. A senior IPPB official said earlier money order was the only link postmen had to the financial system. The launch of IPPB will change that. “Now they (postmen) are well-trained and certified in for cash, micro-ATMs, and even for offering assistance in digital transactions,” he said. The official said there was a three-tier process of training. The NIBF trained the first level of officers. They in turn trained the trainer, who, finally, instructed the postmen. A usual group of trainees at a post office comprised 20-30 postmen. The NIBF evaluated the postmen and gave them certificates. IPPB has a head start over other banks in getting customers as they have a strong base of 170 million post office savings bank accounts. The department is trying to convert these into payments bank accounts. The number of postal access centres across rural areas is 2.5 times of all rural bank branches. The system will face a few challenges as well, such as getting customers into the formal banking system, which is completely technology-dependent and paperless. Postmen-turned-banking officials are excited about this challenge. “The excitement of biometric authentication and an account number coming on SMS in five minutes is a great attraction among senior customers, too. Some of them know us for years. For them, it’s a matter of faith, not the rate of interest,” a postman said as he showed off his progress on the mobile app. Some postal employees, however, are grumbling about the excess burden of work. “They have promised us that they will hire more people very soon. Till then, we will see how much we can do,” the postman said, with a smile.